Born on this date in Grenoble, France in 1946, Andre Rene Roussimoff is better known to the world as former professional wrestler Andre the Giant. The third of five children, Andre did not show any signs early on that he would grow to such oversized proportions brought on by acromegaly, a disease which results in excessive growth hormones. While the rest of his siblings ceased growing at the usual age, Andre's body continued to grow, and at the age of 12, he stood 6 feet, 3 inches tall. He started to make a name for himself wrestling in France where he came to the attention of French-Canadian wrestler Edouard Carpentier, who convinced Andre to make the move to North America, where he moved from the undercard to headliner, performing in front of 20,000 fans in Montreal. This level of success brought Andre to the attention of Vince McMahon, Sr., head of the World Wide Wrestling Federation, who not only signed him to a contract in 1972, but dubbed him "Andre the Giant". 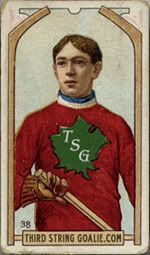 He was now selling out venues such as Madison Square Garden in New York and making appearances in the Boston Bruins dressing room! Phil Espostio explains how the photo came to be in his book "Thunder and Lightning", some of which we can repeat here. "Carol Vadnais was acquired in a trade with the California Golden Seasls late in the 1971-72 season. We were skating around the Boston Garden during the warm-up before a game, and in the stands behind the net was this huge man with a gigantic head and an afro haircut. I had never seen anyone like him in my life. I said, "Who the hell is that? Look at that guy!" Vad said, "That's my buddy, Andre the Giant." After the game Andre came into the dressing room. I used to have a picture of Andre holding me up in one arm and Bobby Orr in the other. We knew this girl who was gorgeous, but who love the Bruins so much she would do absolutely anything for us, and we fixed her up with Andre. We all went out after the game to have drinks. We were in a place on Commonwealth Avenue that had a bar and a swimming pool inside. I'll tell you how big Andre was. He ordered a beer, and when he held it, he only needed two fingers to cover that can of beer. At one o'clock the manager came and asked us all to leave. We were all together, and Bobby Orr said something to Andre, and Andre picked the guy up and threw him into the swimming pool! The cops came and we left." His fame, as well as his frame, continued to grow, as Andre was paired with boxer Chuck Wepner in a 1976 "boxer vs. wrestler" match at Shea Stadium in New York in front of over 35,000 fans, which ended with Andre tossing the 6' 5" Wepner out of the ring. Andre was also the subject of a Sports Illustrated article in 1981, the kind of appeal and mass recognition that few, if any, professional wrestlers had ever achieved at that point. Eventually Vince McMahon, Jr. would take control of the WWWF wrestling empire, shorten the name to the WWF and create the first nation-wide wrestling promotion, of which the crown jewel was "WrestleMainia". 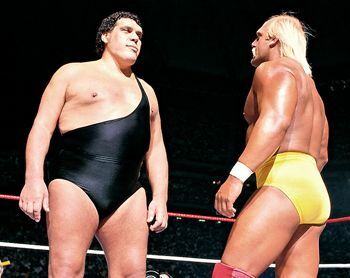 For WrestleMania III in 1987, in the headline match saw Andre the Giant squared off against Hulk Hogan at the Pontiac Silverdome in Michigan in front of a sold out crowd of 93,173 and generated $10 million in pay-per-view sales. He eventually became the WWF Heavyweight Champion. Despite the increasing issues with his health, he continued to wrestle and later make appearances ringside until 1992. In 1993, when the WWF created it's Hall of Fame, Andre the Giant was the very first, and only, inductee that year. He also crossed over into television and movie roles, well known for his portrayal as Sasquatch in the TV series "The Six Million Dollar Man" and most notably for his role as "Fezzik" in the movie "The Princess Bride". Andre passed away at the age of 46 in his sleep from a heart attack on January 27, 1993 in Paris, France. In honor of Andre the Giant, today we take a look at some giant hockey jerseys. 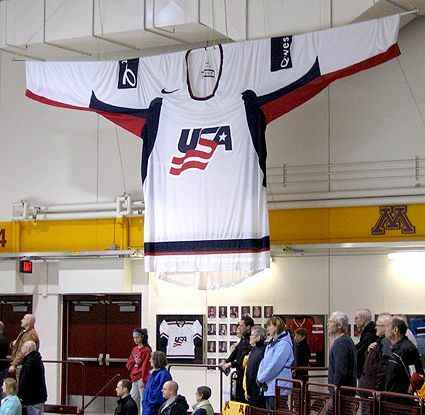 The United States Women's Olympic team toured with an oversized promotional jersey in their Qwest Tour exhibition season leading up to the 2010 Olympics in Vancouver. There were actually two of them made by Nike at a cost of $1,000 each. 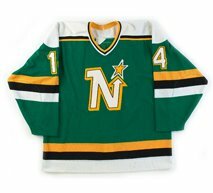 Aside from the fact the jerseys are 26 feet wide from cuff to cuff and 17 feet tall, they are the same as a regular jersey, only on a much bigger scale. 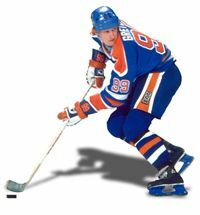 Another notable jersey, 10 feet tall and 20 feet wide, is an Edmonton Oilers Wayne Gretzky jersey made for the Wayne Gretzky Fantasy Camp VII in 2009, which consists of 23 yards of fabric, compared to three for a normal jersey, which took seamstress Patsy Elmer approximately 35 hours to complete. 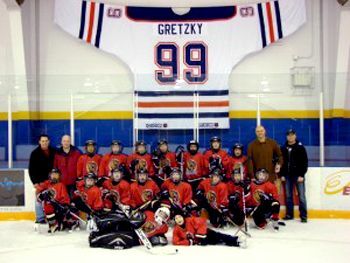 After the conclusion of the fantasy camp, the jersey now resides in an arena in the Frank Lacroix Arena in Fort McMurray, Alberta. 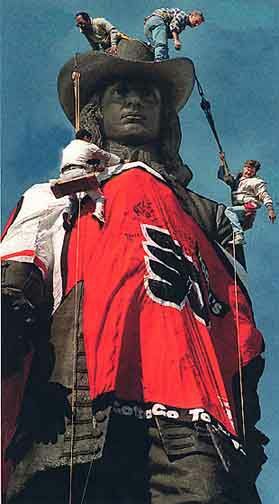 Another enormous jersey decorated the statue of William Penn on top of City Hall in Philadelphia, Pennsylvania in 1997 when the Flyers made it to the Stanley Cup Finals. The statue measures 37 feet tall, making the jersey 16 feet tall in our estimation. 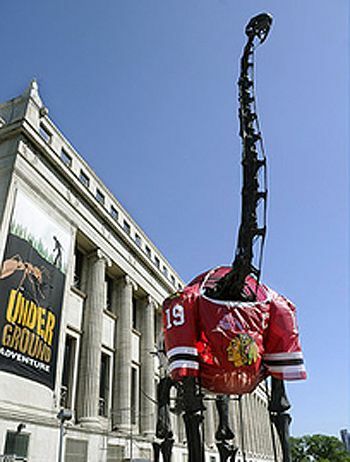 The Field Museum in Chicago has gotten on the Blackhawks bandwagon, dressing their three story high cast iron Brachiosaurus statue in a Jonathan Toews jersey for the playoffs recently. 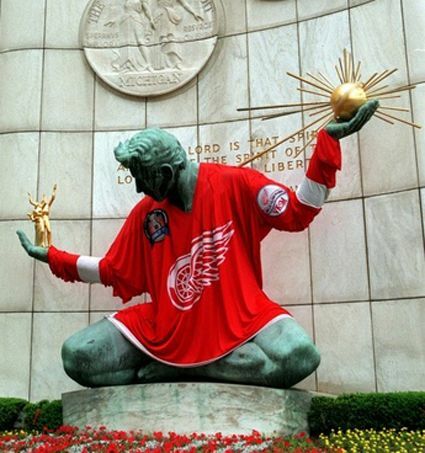 Perhaps the most famous oversized jersey is the Detroit Red Wings jersey, traditionally used to dress the 26 foot tall Spirit of Detroit statue in downtown Detroit since they made the finals in 1997. 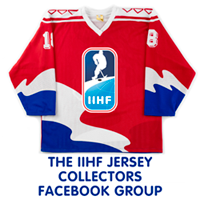 The jersey has actually undergone several variations, including sporting the 1998 Stanley Cup Finals and Believe patches, a very nice touch and great attention to detail. 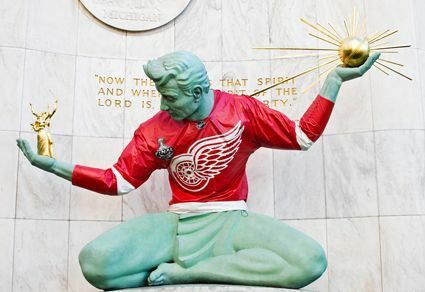 Other Detroit landmarks have seen Red Wings jerseys make appearances during the Stanley Cup Finals, with both the statues on the Wayne County Building and the Tiger statues outside of Comerica Park getting into the spirit. 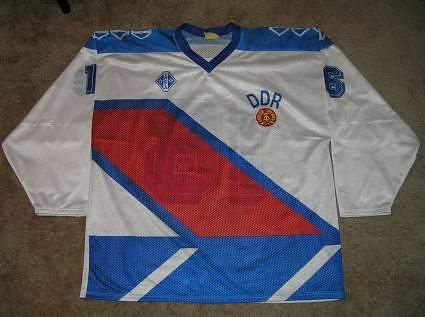 If you are aware of any additional oversized hockey jerseys, we'd love to hear about them. Either post them in the comments below, or email us with the details. Today's video section kicks off with the Spirit of Detroit getting dressed for the 2009 Stanley Cup Finals. 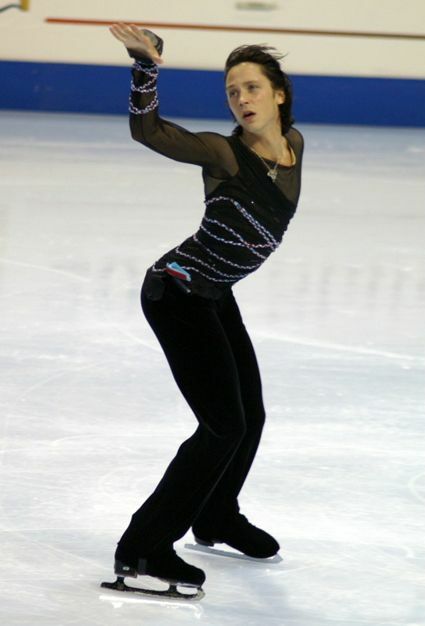 Or is it the 2009 US Figure Skating Championships? Next up is the famous match between Andre the Giant and Hulk Hogan from WrestleMania III. Here are recollections by those involved in the movie of Andre playing "Fezzik" in the Princess Bride.